Against a historical backdrop that includes eighteenth-century language theory, children's literature and education, debates on the French Revolution, Biblical interpretation, and print culture, Blake on Language, Power, and Self-Annihilation breaks new ground in the study of William Blake. This book analyzes the concept of self-annihilation in Blake s work, using the language theories of Mikhail Bakhtin to elucidate the ways in which his discourse was open to the viewpoints of others, undermines institutional authority, and restores dialogue. 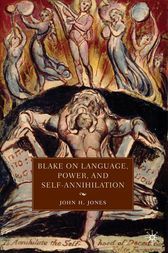 This book not only uncovers the importance of self-annihilation to Blake's thinking about language and communication, but it also develops its centrality to Blake's poetic practice. JOHN J. JONES Associate Professor of English at Jacksonville State University, USA.